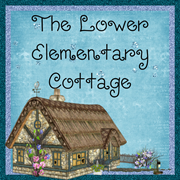 The Lower Elementary Cottage: How a BINGO game can save the day... or at least lead to a happy one! How a BINGO game can save the day... or at least lead to a happy one! It's amazing how one little thing can make a HUGE difference! 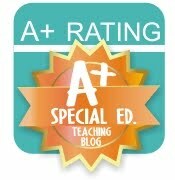 For me, all it took was a game of Addition BINGO in my class today. And an added bonus moment thanks to a Robert Munsch book. If you've ever been a SPED teacher, then you understand what happens when a SPED kid loses a game. It can be a full blown kicking, screaming tantrum that can last for hours! At one point subs were banned from giving the kids board games when I wasn't there to supervise and play social skills coach through every step of the game. I think it all stems from a huge blow to their self confidence when they know they already don't do as well as all the other kids in class. Add in losing at being crummy at yet another thing and the kid feels like a failure and has a fit. Yesterday my cottage roommate (AKA my super awesome speech teacher friend) worked on "The Destroyer of Fun" who is one of the Social Thinking Unthinkables. He gets in your head and makes you super competitive and you destroy all the fun when you don't win. He got mad when he lost a speech game, but she had him rip The Destroyer of Fun out of his brain and throw it against the wall before he could ruin the fun. I was cracking up laughing at this by the way! Then the kid stopped his fit, and said "good game" and was perfectly fine. This has NEVER happens! We were so proud! I tried to see if it would happen again a few minutes later during BINGO, but he happened to win so there was no real test there. I'm a meanie teacher and manipulated the game to make him lose. He's a kindergarten boy and totally didn't notice he had 5 in a row because it was diagonal and not up and down. I conveniently didn't tell him, then intentionally picked the addition cards that would make another student win. Little guy did great! He surely wasn't happy but he didn't have a fit because he knows he'll drop levels on our behavior chart instantly. I reminded him of the Destroyer of Fun and without missing a beat he pretends to rip the Destroyer of Fun out of his brain, threw it on the floor, stomped on it, threw it in the trash, then calmly sat in his chair. I've never been so proud! He calmly asked not to play again and I said no, and he went ahead and played again anyway! It was great! Not to mention it was Addition BINGO so he was practicing how to add using counting on which is a 1st grade skill and he's in kindergarten. Whoo hoo! For storytime we read Roar! by Robert Munsch which is about kids who wake up grouchy then think it's funny to roar like lions all day. It's HYSTERICAL! It's even better if you have the CD like I do with Munsch reading his own book aloud with all the crazy noises he makes! Anyway... because it was fun and it's the last week of school, I let all the kids give me their best ROAR right before the story began. One munchkin is the definition of autism and doesn't interact with others if he doesn't have to, and he surely doesn't play pretend very often. I got him to roar!! I was thrilled!! Then it got even better... after the story he asked one of the boys "_____ will you roar again for me please?" The he goes to another boy and asks, "Will you roar for me too please?" I know this is like nothing, but in my world IT'S EVERYTHING! I have waited all year to get this kid to voluntarily talk to a classmate just because he wanted to, not because he was told to. I squealed and rubbed his curly head of hair telling him how proud I was that he talked to friends! After round 1 of BINGO was a success by getting rid of the fun destroyer, my ROAR boy decided he was done playing. So I made a deal with him that he didn't have to play, but he had to lead the game and pull out the math problem cards and show them to his classmates. HE DID IT!! He "kept his brain in the group" (not stimming or going off into his own little world) the whole time! Then after he read the problem, he'd prompt my kinder boy! For example, "B 8 + 4, put 8 in your brain and count on 4 more and find it in the B section." Can you tell he not only listens to my directions but can teach it to a classmate without being told to?!?! I told his mom today and she was in shock that he was able to do those things! Then she laughed that of course my class is suddenly perfect the last week of school! Haha. Have you had any moments of greatness during board games?